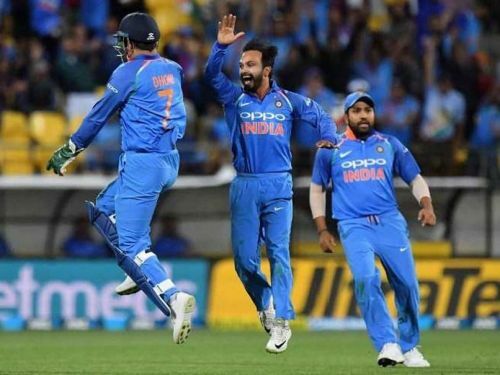 After a thrashing in the penultimate ODI at Hamilton, it was about making a comeback for India in the final ODI of the series at Wellington after already having claimed the 5-match series. On the other hand, Kiwis were keen to carry on the momentum from the last ODI and end their dismal series performance on a high. Winning the toss, India decided to bat first as they made as many as three changes in their playing XI. MS Dhoni came after a gap of two ODIs replacing Dinesh Karthik, while Mohammed Shami replaced Khaleel Ahmed and Vijay Shankar got a game in place of Kuldeep Yadav. The hosts made a forceful change to allow Colin Munro with another opportunity as he replaced the injured Martin Guptill. Batting first, the Indian top order once again crumbled against the moving ball. The likes of Rohit Sharma, Shikhar Dhawan, and Shubman Gill failed to provide a good start to the team as inside ten overs, India lost four wickets at a score of 18. 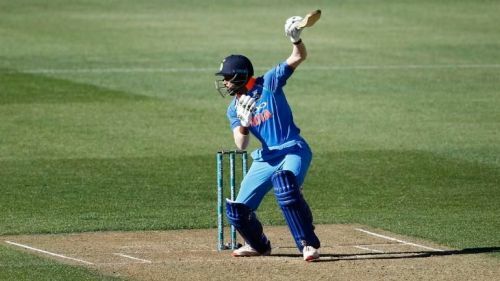 India was once again staring down the barrel with a top-order collapse but this time, the duo of Ambati Rayudu and Vijay Shankar played smartly to arrest the slide. The two added 98 runs to see India out of trouble. To end things, Hardik Pandya played a gem of a knock to provide the finishing touches with his quick fiery 22-ball 45. India ended their innings at 252, giving their bowlers enough chances to make a game out of it. Chasing a tricky total, Kiwis couldn't begin well as they lost two crucial wickets in the power-play. Soon after, even Ross Taylor was back to the pavilion. However, Kane Williamson and Tom Latham steadied the ship with their 67-run partnership. But the wicket of Williamson saw the floodgates open for India as the visitors ripped through the Kiwi's middle and lower-middle order despite Jimmy Neesham's 32-ball 44 giving his team a glimmer of hope. However, it was too much to ask for the Kiwis as they fell short by 35 runs to hand India yet another clinical performance to secure a 4-1 series victory. It was a yet another top-order collapse for the Indian team at Wellington as Kiwis struck four times in the first ten overs. Though India had Ambati Rayudu and Vijay Shankar at the rescue to bail the team out of the trouble, it was Hardik Pandya's innings that gave India the much-needed flourish at the fag end of the innings. It was a perfect platform set for Hardik as he could strike from the first ball. He didn't take long in making his intentions clear and took the charge against the leg-spinner, Todd Astle. He smacked Astle for three consecutive sixes in an over to plunder 18 runs off his over. This was not the first time when Pandya showed his skills with the bat to stroke three sixes consecutively against a bowler. This was the fifth time when he smacked a spinner for 3 sixes in an over. Before this, he smashed Imad Wasim, Shadab Khan, Adam Zampa and Malinda Pushpakumara to achieve such a feat.